Definition at line 82 of file ipcache.cc. Definition at line 85 of file ipcache.cc. Definition at line 220 of file ipcache.cc. Definition at line 225 of file ipcache.cc. Definition at line 110 of file ipcache.cc. Definition at line 231 of file ipcache.cc. References CbcPointer< Cbc >::clear(), debugs, Dns::CachedIps::empty(), receiverData, receiverFun, receiverObj, CbcPointer< Cbc >::set(), CbcPointer< Cbc >::valid(), CallbackData::valid(), and CallbackData::validDone(). 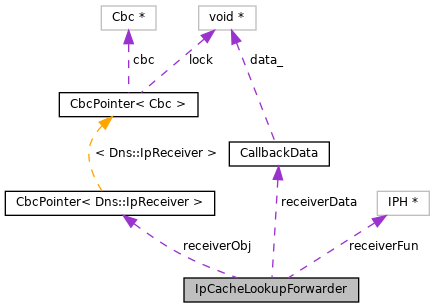 Referenced by ipcache_nbgethostbyname_(), and ipcacheCallback(). Definition at line 266 of file ipcache.cc. References forwardIp(), Dns::CachedIps::good(), receiverObj, and CbcPointer< Cbc >::set(). Definition at line 250 of file ipcache.cc. References debugs, receiverObj, CbcPointer< Cbc >::set(), and CbcPointer< Cbc >::valid(). Referenced by ipcache_entry::addGood(), and forwardHits(). Definition at line 278 of file ipcache.cc. References additionalLookupDelay(), current_time, receiverObj, CbcPointer< Cbc >::set(), and CbcPointer< Cbc >::valid(). Definition at line 100 of file ipcache.cc. Definition at line 106 of file ipcache.cc. Definition at line 116 of file ipcache.cc. Definition at line 115 of file ipcache.cc. Definition at line 114 of file ipcache.cc. Referenced by finalCallback(), forwardHits(), forwardIp(), and forwardLookup().